Slice the ciabatta bread lengthwise, so that there is a top and a bottom slice. Spread 3-4 tablespoons of fresh pesto over the bottom piece of bread. Top with salami and mozzarella cheese. Top the cheese with your basil leaves, then place the top of the bread on the sandwich. Press down on the sandwiches with your hands, then very tightly wrap them in plastic wrap (do this as tight as you possibly can). Place the sandwich in the fridge and top with lots of heavy books, a weighted down pot or pan, or whatever other heavy objects you can find. 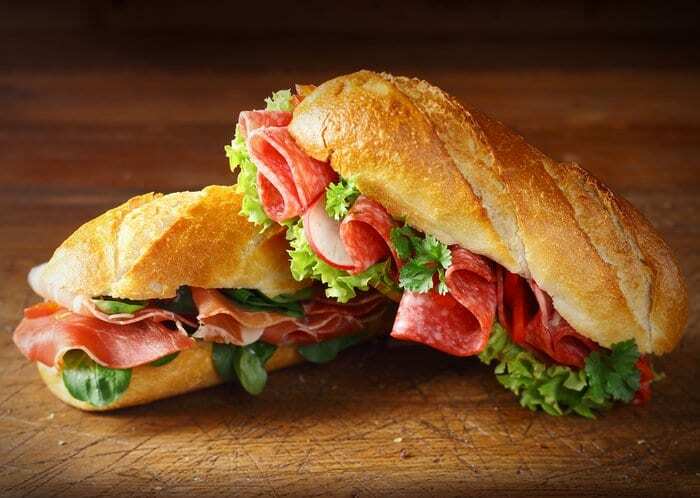 When you are ready to eat, unwrap the sandwiches and use a very sharp knife to cut the sandwich into small sandwiches.